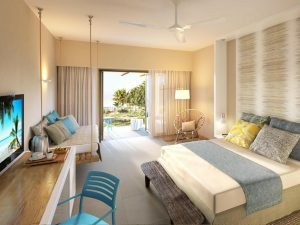 A breath of fresh air and flare in the West Coast, Anelia Resort & Spa is a newly built 4 star resort with 150 rooms. From the rustic and traditional thatch and shingle roofing to the chic modern designs, the resort concept conveys the guest into time travel. 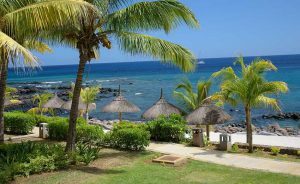 Resort offers a choice of spacious Seaview rooms and Garden-view bungalow – both complete with our friendly services and amenities. 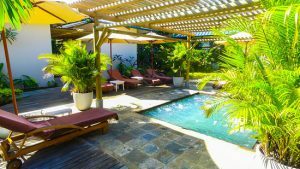 The rooms includes: * air conditioning * telephone and TV * safe deposit box * minibar * shower * ocean view balcony or terrace The bungalows are located in a nice tropical garden with a peaceful surrounding. 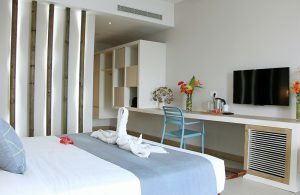 All our spacious rooms, are ocean-view, with balcony or terrace. The bungalows with air conditioner and fridge and terraces are ideal for facilities with children. The Bungalows includes: * air conditioning * telephone * fridge * microwave oven * lounge * shower * veranda Bungalows are available in 1 to 3 bedroom size. 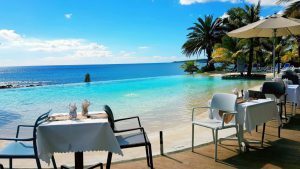 Location:Resort located in Flic-en-Flac is a seaside town on the west coast Mauritius in the district of Black River. 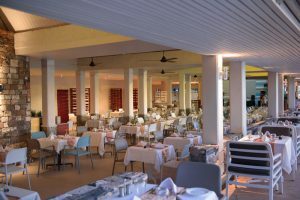 Experience the exquisite tastes in the main restaurant where the guests are entertained with a themed dinner every night or indulge into the lavish seafood grills on the beach esplanade, there is something for everyone’s palate. Bringing you back to the modern world, relish the juicy burgers and BBQs at the Burger Bar overlooking the main pool and the ocean. A wide range of water and land activities awaits you at Anelia Resort & Spa. There will surely be something for everyone like yoga or bocce ball for the laid back customer or scuba diving for the adventure-loving active customer. A bundle of sports and leisure to make your stay as enjoyable as possible. 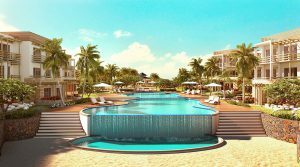 Fitness center, games room, tennis court, aqua-gym, beach volley, bocce balls and yoga classes, Guests will be pampered for physical activity choices. The fully air-conditioned fitness centre is equipped with a comprehensive range of Cardio multimedia equipment, body-building machines as well as an extensive range of weights. Personal trainer service is also available at a fee. Watch out for our weekly land and water sports competitions and win fun prizes, organized by our entertainment team – where guests of all ages can participate. 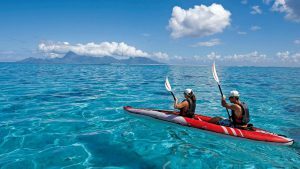 Surrounded with water, it is impossible not to think of water sports as part of the must-do things while you are in Mauritius. The boat house will assist you with all your bookings and services regarding both motorized or non-motorized water sports activities readily available at the hotel; Glass bottom boats, kayaks, pedal boats, boat outings, traditional fishing, snorkeling, scuba diving (PADI diving certification) to name a few. Some activities such as scuba diving require advanced bookings and a supplement charge. Would you like us to manage your flights?